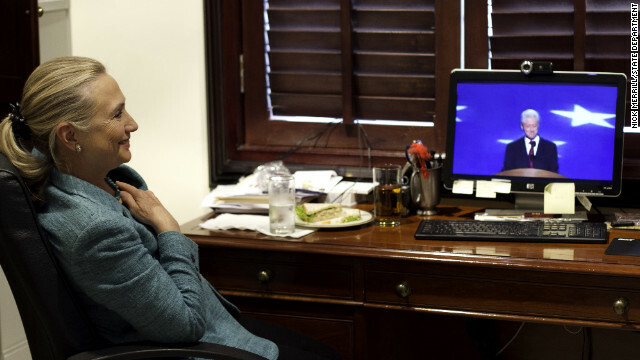 (CNN) - A photo released by the State Department shows Secretary of State Hillary Clinton watching her husband deliver remarks Wednesday night at the Democratic National Convention. Hillary Clinton didn't watch the speech live because she was busy meeting with leaders of the tiny nation of East Timor, 9,963 miles from Charlotte, North Carolina. According to reporters traveling with the secretary of state, Clinton watched a taped version around midnight eastern time. Asked about the speech at a press availability, Clinton noted that it was American political tradition for secretaries of state to not attend party conventions. "I think it is a good rule," Clinton said. "It's one that I certainly accepted. This is the first convention I have missed in many, many years." She added that her husband read parts of his speech to her over the phone before delivering his remarks. "It's a great honor for him to be nominating the president and I'm delighted to be here in Timor Leste on behalf of the United States in furtherance of our shared values, interests and security, and I'm grateful that I had the opportunity to visit and have these discussions today," she said. Clinton, who hasn't missed a Democratic convention in four decades, is on an 11-day swing through the Asia-Pacific region, visiting a number of counties, including China and Indonesia, and standing in for President Barack Obama at the Asia-Pacific Economic Cooperation forum later this week in Russia. Obama bowed out because of the campaign. The State Department says the photo was taken at the home of the U.S. ambassador to East Timor. They also added that any graphics on the screen were removed, indicating they were not endorsing one television network over another. CNN Foreign Affairs Correspondent Jill Dougherty contributed to this report. Sec. Clinton is the best Secretary of States ever! She already wrote so important page in American history! Sec. Clinton already show that military and intelligence MUST go hand – in – hand with diplomacy… and she build new bridges that this country desperately need… Ms. Hillary conform what Adm. Mullen said: “ Making friends is cheaper than fighting war”. She is my suggestion for Presidential Medal of Freedom ! oh for heaven's sake! FYI to whatever intern wrote the post...it isn't 'tradition' keeping Clinton away from the convention – it's the LAW! Federal law to be specific. The Hatch Act of 1939, amended by Congress in 1993, specifically prohibits secretaries of state from attending political conventions, and the State Department's own ethics guidelines also rule out political activity. She is so smart. She stayed away from the Democratic Fiasco. I spy a pale ale next to the plate! I know that you're as proud if not more as we are Hillary. Your husband, our Bill, was exquisite in his delivery, and unequivocably crystal clear and right on the mark in his remarks. It's not just a 'tradition'. It is the State Department guidelines. It is illegal for State Department employees to participate in political activities. Attending would be illegal. One classy lady. I love HC... and Bill too. Someone said recently that if there were no term limits, BC would still be our president. I believe this is true too. He may have had some character flaws.... he is as human as the rest of us, but he always tried to do the right thing when it came to his job. I would have voted for him over and over. For him to support BO, that's an endorsement I take seriously.